USCIB is delighted to honor Ajay Banga, president and chief executive officer of MasterCard. Each year this gala event attracts several hundred industry leaders, government officials and members of the diplomatic community to celebrate open markets and the recipient of USCIB’s highest honor. Established in 1980, USCIB’s International Leadership Award is presented to a senior business executive who has made significant policy contributions to world trade and investment, and to improving the global competitive framework in which American business operates. Join us for what will be a truly memorable evening! ICC Banking Commission Technical Meeting in London, England. With the Trump administration seeking to reorient U.S. trade policy toward bilateral agreements, bilateral trade deficits have been put forward as a marker of the health — or lack thereof — of U.S. commercial relations with a given country. USCIB has taken up this issue in a recent statement to the Department of Commerce. The Commerce Department is expected to hold hearings on trade deficits later this week. The Supply Chain Finance Summit is an annual meeting of CFOs, Corporate credit and risk managers, corporate treasurers, import managers and trade specialists, bankers, insurers, consultants and vendors, promoting the discussion and assessment of issues affecting supply chain finance. In its sixth edition, and for the first time in London, the ICC Academy’s Supply Chain Finance Summit will provide a unique opportunity to learn from experienced corporations and bankers about their visions and strategies in the new area of supply chain finance. You can expect insight and commentary on a wide range of issues: streamlining of trade finance operations, the changing landscape from the BPO perspective, the impact of the regulatory environment, dealing with logistical hurdles, and more. The Summit will be divided into two streams with themes that focus on the corporate and banking sector. Nevertheless, all guests will be brought together in social and networking events. For this year, organizers will offer various new formats of discussions and greater opportunities to engage in the debates. Save the date and be among the firsts, who will experience a Night Owl Session in trade finance, test your knowledge in SCF definitions, and more. The ICC Banking Commission in collaboration with ICC Indonesia is delighted to invite members, National Committees and key players of the banking Industry to the ICC Banking Commission Annual Meeting at the premises of the Shangri-La Hotel. In its fifth edition, the ICC Academy’s Supply Chain Finance Summit will provide a unique opportunity to learn from experienced corporations and bankers about their visions and strategies in the new area of supply chain finance. You can expect insight and commentary on a wide range of issues: streamlining of trade finance operations, the changing landscape from the BPO perspective, the impact of the regulatory environment, dealing with logistical hurdles, and more. The International Chamber of Commerce (ICC) Banking Commission, along with partners, the Wolfsberg Group and the Bankers Association for Finance and Trade (BAFT) recently announced the publication of a revised guidance document on Trade Finance Principles. This broader industry edition now addresses the due diligence required by global and regional financial institutions of all sizes in the financing of international trade. The document was updated to reflect the growing regulatory expectations, as well as the more stringent application of existing regulations faced by the industry today. The collaborative effort will help standardize the practice of financial crimes compliance for trade transactions. The publication of this document is the culmination of more than two years of work undertaken by the organizations and their members. “In keeping with the traditional work of the ICC Banking Commission, this guidance on sound financial crimes risk management for the traditional trade products follows in the steps of the UCP, URC etc. in setting standards by which banks should conduct their trade business and to provide a sound basis for the continuation of the finance of international trade by banks,” said Olivier Paul, head of policy of the ICC Banking Commission. 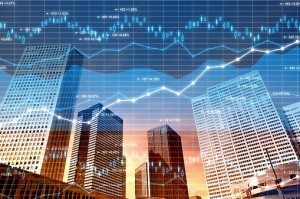 Business executives have identified a sharp decrease in the availability of financing for cross-border trade, according to the latest annual survey of global trade finance from the International Chamber of Commerce. 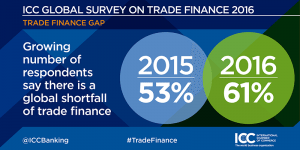 According to the survey — which received 357 responses from 109 countries worldwide — 61 percent of respondents reported a global shortage of trade finance . 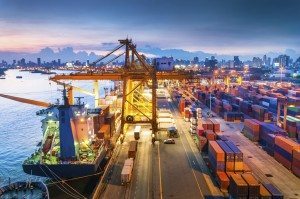 Only 52 percent of respondents reported an increase in trade finance activity, compared to 63 percent in 2015 and 80 percent in 2012. Furthermore, the perceived shortfall came predominantly from regional and global banks — 78 percent and 56 percent respectively, compared to 41 percent of national banks. Read more and download the survey on the ICC website. USCIB joined 14 other business associations urging Congress to approve the Export-Import (Ex-Im) Bank’s quorum requirement so that it may again review transactions over $10 million. 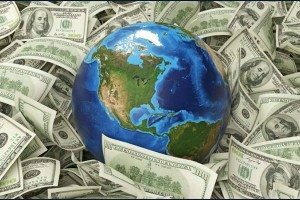 The business associations argued that a fully operational bank would support millions of U.S. jobs by enabling companies to compete more successfully in the global economy. USCIB and others noted that the Bank is a vital tool in leveling the global playing field, helping American businesses secure new customers, particularly in emerging markets. The International Chamber of Commerce was quoted in an article in the Wall Street Journal, “The Unexpected Regulatory Threat to Global Trade,” about a European Union regulation on the short-term financial instruments that connect buyers and sellers of goods across countries. “It’s a poorly thought-out regulation that will hurt EU businesses,” said Emily O’Connor, senior policy manager at the Paris-based International Chamber of Commerce. Read the full article at the Wall Street Journal’s website.